We're kind of a free-range family, but there are times when I need to lay down some rules for my kids. This usually happens in situations where we'll be rubbing up against other people who have high expectations: on an airplane, in a restaurant, at the theater. We read books about the situation beforehand and talk over what to expect, but as the day nears, I need to reinforce the basic guidelines. When I just rehearse the rules with Mikko ad nauseam, he tends to get testy and wants to tune me out. But as a young kid, he does in fact have a limited attention span and shorter memory, so I have to do something to remind him and make sure the rules stick. Because I'm a goof bucket, here's what I discovered works well for getting across the point while still retaining a light-heartedness that doesn't irritate my kiddo. Feel free to borrow my comedy stylings for your preschooler and see how it goes. First, adopt a very serious voice. (It helps if you don't often do so, making it an attention grabber.) 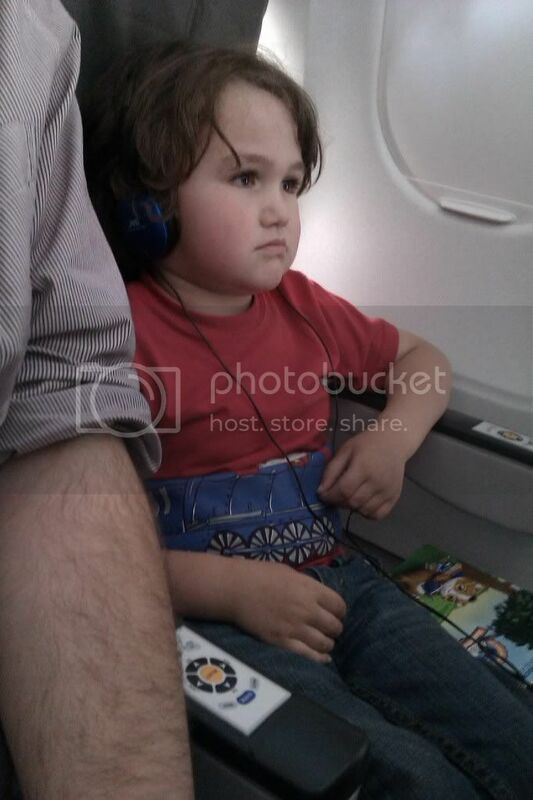 "Mikko, we need to go over the rules for how to behave on the airplane." Then you insert the actual guidelines first: "You need to sit in your seat and wear your seatbelt except if you have to go to the bathroom. And you need to listen to whatever the pilot and flight attendants tell you to do." Then you keep up the very serious voice and eye contact and continue with a straight face with rules that sound mildly plausible but might make your child prick up his ears, so to speak: "Also, there's no sitting upside-down in the seats. And you're not allowed to spit on the people in the row ahead of you." 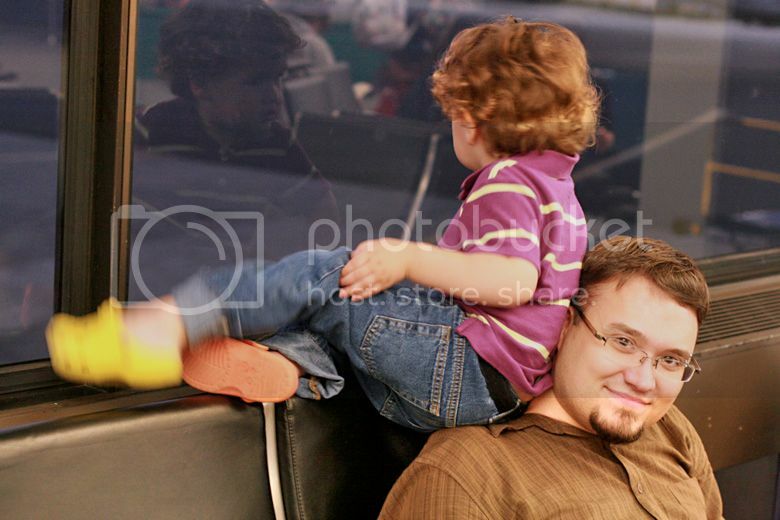 At this point your kid probably won't be sure if you're serious or not, so continue, very solemnly: "There's absolutely no sitting on the wing of the plane. Unless you bring some duct tape to make sure you're really secure, and wear a hat. And if you have to use the restroom on the plane, you have to pat everyone's head on the way back and yell 'Duck duck duck GOOSE!'" At this point your kid should be giggling uncontrollably, so really turn it on: "If you bring a camel on the plane, it has to fit under the seat in front of you, even the hump. Cows must go in your checked baggage in the luggage area unless they've paid for a ticket. Monkeys have to sit on your head." By this point, Mikko's generally contradicting me and throwing his own jokes back, like, "I will NOT let a monkey sit on my head!" or "I'm going to STAND on the wing!" or just the classic "That's not true, Mama! You're being silly." If there's no other adult handy, I just reference distant authorities: "The pilot is not going to be happy with you if you let the camel sit on your lap. He'll probably make us get out and fly on top of the plane." Mock disappointment works a treat. If it's hard to think up absurdities on the spur of the moment, feel free to come up with some escalations in advance. At the risk of sounding like Mr. Collins, I think that's a valid comedic technique. Don't make me remind you again. Anteaters and platypuses go on shoulders, not boys. What's the result of all this tomfoolery? A happy, belly-laughing occasion for both of you (once you can't hold in your own laughter any longer), and parent-child connection since you're sharing the joke. An easy reinforcement of the actual rules. A humorous memory to reference when you're finally in the situation — once you're on the plane, for instance, you can stage whisper, "Now, remember: Sit in your seat, keep your seatbelt fastened, and NO taking the monkey off your head!" The mood will be lighter even as the actual rules are once again put freshly into your little one's mind. In case you're wondering, I've never had a problem with Mikko failing to follow the actual rules due to associating them with the silliness, or with him trying to follow the imaginary ones. As long as your kids are the appropriate age to appreciate humor like this, it all seems to settle out in their minds correctly. What do you think? I'm happy to present ideas like this because I am so not the kind of person who has other amazing gentle parenting techniques down pat (I never remember to breathe deeply or count to ten, for instance) — but this sort of nonsense comes naturally to me. Do you put on comedy routines for your kids? How does humor help you pave the way for gentle parenting? I love it! We do this at dinner time a lot when my little guy has a case of the "no, no, no" for each option. We start with the reasonable: spaghetti, noodle soup, etc. and then start throwing in crazy options like monkey sandwiches or pickle pizza. It makes him listen and pay attention to what I'm actually saying rather than just "no"-ing everything. It never actually occurred to me that this could translate so well to other situations. Thank you for this idea! It's great to finally have a moment to read your blog again...I've so enjoyed what you've had to say over the years, and this post is no exception! We just went on a plane, and it would have been great to have your ideas in my back pocket. Fortunately, our Kaya (nearly 4) was amazing on the plane...only had to remind her once about what is expected of her. But I'm wondering...as you've written about bilingualism in the past, do you do this parenting in German? How is that endeavor coming along? Hope all is well! Happy New Year! Brilliant! I do occasionally use humor to my "advantage," but not necessarily in such a situation. Do you think this would work at home or would it come up too often? For instance... No pushing your brother down... and no pulling hippos up?